So … which do you prefer? Great Bordeaux or bulk crude oil? The answer depends on your perspective, I think. For drinking there is no choice — red wine trumps black gold. No doubt about it. But how about if you look at the choice from an investment perspective? The surprising answer is that it makes little difference. 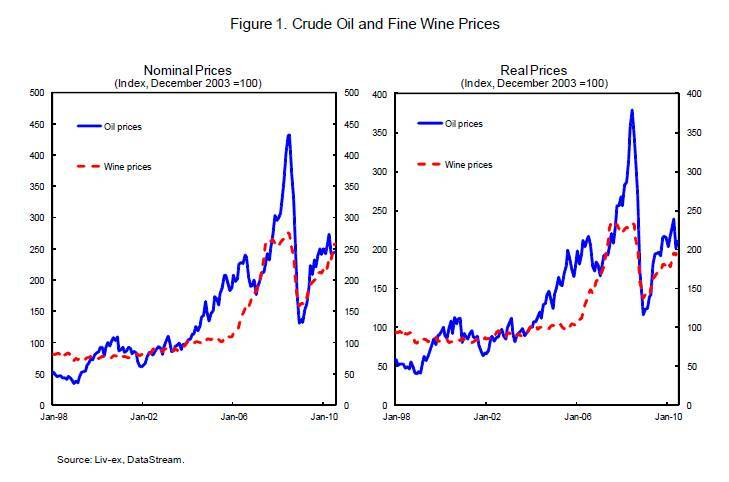 The prices of fine wine and crude oil have been highly correlated in recent years. Or at least that is the conclusion of two economists at the International Monetary Fund, Serhan Cevik and Tahsin Saadi Sedik, as reported in their recently published paper “A Barrel of Oil or a Bottle of Wine: How Do Global Growth Dynamics Affect Commodity Markets?” (click on the link to download a pdf of their working paper). The graph shown above indicates that price indices for crude oil and investment-grade wine are highly correlated. Wine follows the twists and turns of oil prices, although it is somewhat less volatile in terms of peaks and troughs. The conclusions are more or less the same if real data are used instead of nominal measures. Who would have guessed? How is Oil Like Wine? What do oil and fine wine have in common? Darn little, from the drinking standpoint, but quite a lot in terms of supply and demand. Both commodities have relatively inelastic supplies, according to the study authors (although for very different reasons, as you may imagine), so that changes in demand account for the majority of price movement effects. The authors find that the same macroeconomic factors that push up the global demand for oil are associated with rising auction prices for the fine wines in the Liv-Ex index. Certainly in recent years it must be true that China’s fast growth has impacted the relatively narrow investment wine market and the much broader global commodities markets in the same way, albeit for different specific reasons. So what? Well, the study tells us a number of interesting things. First, it indicates that economists at the IMF have not entirely lost their sense of humor– a good thing, I suppose, since they are part of the glue that holds the global financial system together (hey Mr. Euro, I’m talkin’ ’bout you!). It is comforting to know that they think about the real world and are not limited by the formal constraints of their charts, graphs and equations. Second, as the Financial Times points out, it shows that adding wine to an investment portfolio does not necessarily usefully diversify it if oil is also in the mix. You might not have guessed this correlation, but there it is. Always good to do research and not rely upon common sense or intuition. Finally (and here you need to actually read the paper by following the link above), the authors note an important shift in the global economic center of gravity. Whereas only a few years ago the changes in both oil and wine prices would have been explained by U.S. and Western European economic variable, now it is the emerging markets that have the most clout. The driving forces of world commodity markets have new postal codes. You don’t need to read tea leaves to get the new address — wine and oil both point the way! I agree. Both oil and fine wine have been problematic investments in 2015. Thanks for writing.